THE EYES. Somehow, from behind those wraparound shades, those eyes see everything. Within fractions of an inch, they know what went right and what went wrong. And why. Instantly, Nick Bollettieri can analyze and correct. He can size up strengths and weaknesses. He can read form and fire, and adjust accordingly. Bollettieri is an impressive man. He's a rich and famous person who knows lots of other rich and famous people, and of course the catch is that he helped them become rich and famous. Which in turn makes him even more rich and famous. He's very, very good at what he does. "I think I read people fairly well," he says. "I'm able to find little things and be able to express it to them." Nick Bollettieri is a coach. A tennis coach. Perhaps you've heard of him. Any big name star in the past 20 years? It's more likely than not that they've had at least a few lessons from him, exposed their game to those eyes behind the shades. The kids at the Hawaii Tennis Academy are not rich and famous. But now Bollettieri is standing before them, demonstrating a swing and telling a story. "You know who started that and everybody thought he was crazy? Huh?" 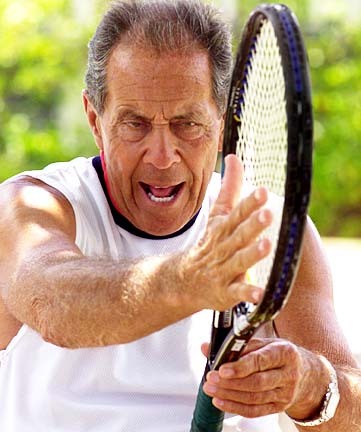 Bollettieri uses the racquet to gesture at himself. "Me. With who?" Agassi, came the mumbled answer. "And what girl was with them?" All of them. Under Bollettieri's tutelage. At once. Quite a class. "These kids are getting the deal of a lifetime," says Hawaii Tennis Academy director Ty Aki. at the Hawaii Tennis Academy on Thursday. AKI HAD BEFRIENDED Bollettieri's son, Jimmy, who is thinking about spending a few months a year in Hawaii. 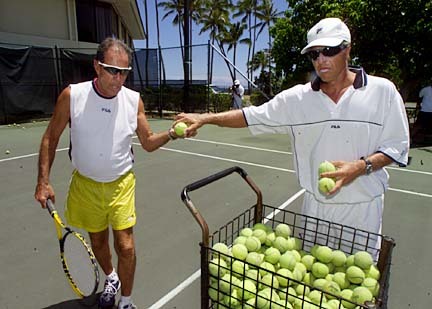 The younger Bollettieri thought it would be a good idea to help HTA put on a 13-day boot camp to prep Hawaii's young 16-and-under and 14-and-under players for mainland national tournaments. The next thing you know, here came Dad, signing on to work with the kids for five hour sessions this past Friday and Saturday for much, much, much less than his usual $24,000 a day fee. (It was $475 for 13 days of camp, including two days with Bollettieri). Sometimes, Bollettieri said, it's an important thing to do to cultivate tennis in an area. Not everyone can afford to go to the mainland for training, so he comes here, helps Hawaii players get better. It's a long range investment, for all involved. "An awful lot can be done if you know how to do it," he said, gesturing to a busy court as his son fed balls to Hawaii students nonstop. "Then eventually, you know, some of these kids get pretty good and some of them will come over to the (Bollettieri) Academy full time." He coaches with intensity and tenderness. He is stern but forgiving. Fun but businesslike. He calls the players "dear" and "son" and the lessons sink in fast, because if they don't, he calls you on it. The kids find that out in a hurry. The eyes miss nothing. "That's pretty darn good," he says as a kid heeds his advice. To another a second later, "That's 100 percent better." But now here comes the bomb, and don't think he hasn't planned it. This is not hang out with a celebrity time. This is not your chance to giggle with a legend. This is time to work, he lets them know in no uncertain terms, raising his voice and telling them that a coach who's had seven No. 1 players in the world doesn't have time to kid around. "You saw how that meeting out here shaped up with the kids," he says later. "I mean you have to let them know, hey, we're here to learn. After I said that, you saw the whole attitude change." This was a real practice now, one with the man who's taught Agassi and Pierce, Venus and Serena, Becker and Kournikova. It was time to take advantage of it. No spacing out. "It (the horseplay) all stopped," Bollettieri says. "(If it doesn't stop) I'll walk out and go to the beach." BOLLETTIERI IS A colorful man with colorful stories who can drop names better than Larry King. But it's not bragging. It's all part of the lesson. Everyone has different strengths and different styles. This is what Monica Seles did with her backhand. Maybe you'll use two hands, too. This is how Jim Courier overcame this weakness. But that's also why he retired early. Arantxa Sanchez-Vicario can run for days. That's why you should always follow a shot. He's a man who appreciates attitude. And he has stories for that, too. John McEnroe won 85 percent of the matches in which he threw a fit. "He wasn't mad," Bollettieri says. "He was in Hollywood." Boris Becker walked into Wimbledon as if it were his personal domain. "And never once did an official ever talk to him." At age 11, he knew Hingis was a star because, "Her attitude, even when she missed it, sort of showed you that she made it." But these kids, these Hawaii kids, need some work on their attitude. They're not up to Bollettieri standards just yet. Calls for volunteers go unheeded. They hang back, hoping someone else will step forward. At least at first, they're shy and timid. And this is another thing to be corrected. He tells them to charge ahead, stick their chests out, take a chance. "So what if you make a mistake," the best coach in the world says. "Who cares?" The kids learn, attacking each assignment now. The balls come and the feedback continues and with each swing their concentration holds. Many are making progress already. Bollettieri steps back to let the coaches run the drills. He takes in the whole scene, the players, their form and hustle and sweat. Nothing escapes his notice, and the kids know it. Behind those wraparound shades, the eyes that had shaped the greats of tennis were now on them.